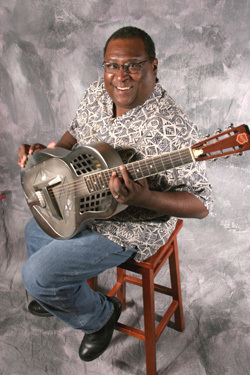 Rick Franklin, from Virginia, has been playing and singing the blues at local and international festivals and community events, as well as various clubs and cafes, both in and around the Washington DC area since 1981. In addition to solo performances, Rick also performs 1920s and 1930s blues and ragtime in the Memphis and St. Louis guitar duet style with the popular acoustic blues trio Franklin, Harpe, and Usilton. Rick is personally committed to the preservation and diffusion of the Blues, especially amongst the young. He has been a member of the Euroblues annual Blues Week faculty for the last 5 years. He has also taught blues guitar at the Augusta (W. Va) Heritage Center and at the Port Townsend (Washington) Blues Week programmes.